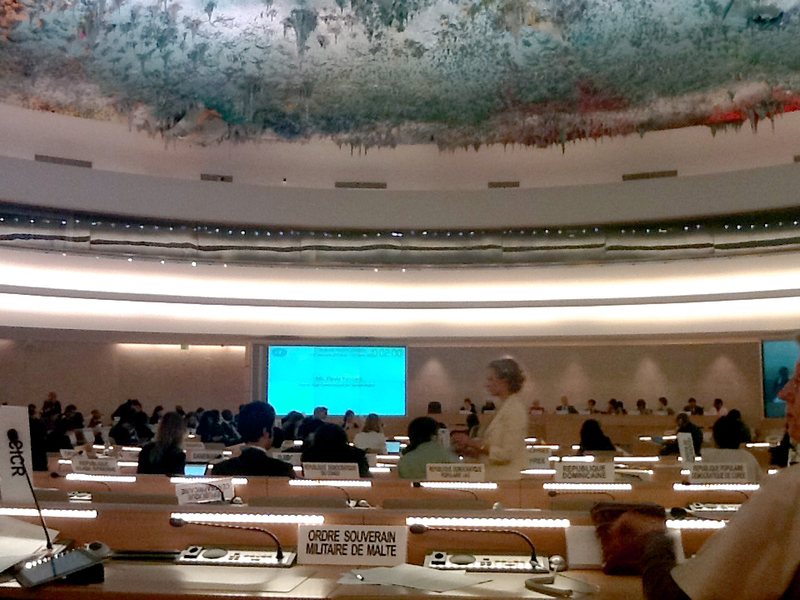 On Wednesday we were back in the main room (the one with the funky ceiling) for the Annual Day of Discussion on Women’s Rights – great to see a whole day dedicated to this subject at the Human Rights Council (HRC). It was an important day for the World YWCA and the Y movement, because we had prepared a statement that focused on child, early and forced marriages that Jenna read out to the assembly in the afternoon. There’s no guarantee for NGOs as to whether they’ll actually have an opportunity to speak, because it all depends on what states have to say (they are given priority) and how much time remains after they have all spoken. The first panel discussion of the morning focused on reflecting on efforts to eliminate violence against women, from the Vienna Declaration and Programme of Action to the 57th session of the Commission on the Status of Women (CSW). The opening statement was made by Ms Navanethem Pillay, United Nations High Commissioner for Human Rights, with the discussion moderated by Ms Rashida Manjoo, Special Rapporteur on violence against women, its causes and consequences. Ms Pillay provided an overview of the recent history of women’s human rights, highlighting CEDAW and the Vienna Declaration as milestones in reframing the debate on women’s human rights. Ms Schulz spoke on behalf of the CEDAW committee and how it worked to frame violence against women as a form of discrimination. She also noted the importance of the contribution that NGOs make on informing this issue, and that the Committee has institutionalised the participation of NGOs and civil society in its work. violence against women continues all over the world and that dealing with it is not just the job of the Committee alone. While the Committee has no legal power to enforce its recommendations and many states are slow and irregular in their reporting, the CEDAW convention provides a holistic legal framework to be able to effectively tackle this issue in an international setting like the HRC. Ms Butegwa then shared some positive trends regarding violence against women, noting that 34 African countries now have legislation to eliminate violence against women. She thanked the participation of the CEDAW committee and supportive states in making this a reality. We then heard from states on the issue, what their country had done to address the issue, and their suggestions for next steps to eliminate gender discrimination and violence against women. States who were particularly strong in their positions included: Brazil, Estonia, Canada, Lithuania, Chile, South Africa, Norway, USA, and Greece, as well as the European Union. I noticed a common theme emerging, that was first noted by Ms Pillay in her opening address, and that is that implementation of resolutions is still a big problem. Sierra Leone suggested that we need detailed action plans that are country-specific, include targeted strategies for different population groups, and media strategies and effective message dissemination for public education and awareness-raising campaigns.